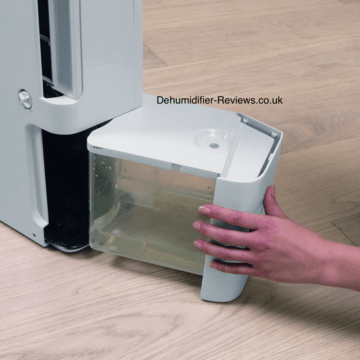 The DeLonghi DES14 Compact Dehumidifier sits in the middle of DeLonghi’s evergreen refrigerant dehumidifier DES range, between the DES12 and DES16e and occupies the same shell as those two models. The only difference between the three models is in the power of the units of 180W, 230W and 250W (all very efficient versus the competition in their respective classes) and also that the range-topping model has a digital control panel versus the manual control panels seen on the other two models. DeLonghi were historically the name when it came to dehumidifiers, however recent competition from EcoAir has knocked them from their top spot. In this reviews let’s see if the DES14 has got what it takes to compete. The manual control panel is by far my biggest gripe with the DES14, it’s a single rotary dial and the type that I’m sure we’ll see less and less of in the market in the future. With the dial in its most anti-clockwise position the machine is switched off. Twist it from here and moving clockwise you’ll take it through zones marked ‘min’, ‘med’ and ‘max’, which are your general dehumidifying options. On the positive side this allows for fine adjustment of the humidity, on the negative side you have very little idea what humidity you’re actually setting. Humidity meter & thermometer combos are available very cheaply and this could help to fine tune your humidity levels if you’re seeking a particular humidity. If you’re just wanting your home to keep within the ‘ideal’ 40% to 60% relative humidity range, then you should be able to achieve this by just setting the DES14 somewhere between ‘med’ and ‘max’. 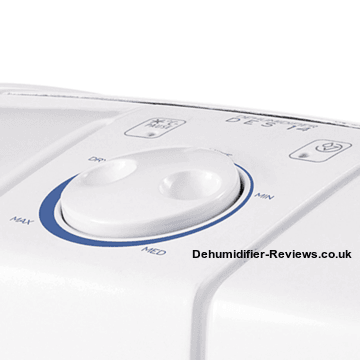 Twist the dial to its most clockwise position and you’ll set it to ‘dry’ mode, which is this machine’s version of the ‘laundry’ or ‘turbo’ modes that you’ll see on other dehumidifiers. Whereas in the normal dehumidifying mode the machine will stop dehumidifying and go into fan-only mode when it reaches a certain humidity, in ‘dry’ mode the machine will dehumidify continuously, no matter how low the humidity gets. This mode will dry a particularly damp room or laundry much faster, because driving the humidity levels lower causes more evaporation from the surroundings. However the machine should not be left in this mode on a permanent basis or there’s a risk of causing damage to it. 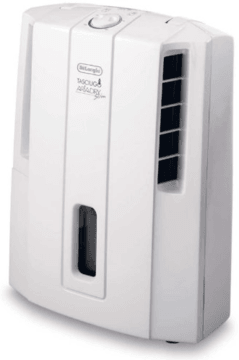 This mode isn’t as good as some rival machines as the DES14 only comes with one fan speed, while some rivals have two, which gives those machines stronger airflow and therefore faster extraction. Also on the control panel is an LED that indicates when the water collection bucket is full. Thankfully the water collection bucket is quite large for this size of machine, with a 3 litre capacity. The collection bucket slides out from the side of the appliance, so is relatively easy to access. The bucket has a lid to minimise spillage, but there isn’t a handle, so you’ll need to be careful when carrying it. There’s a very clear viewing port on the front of the machine into the bucket, so it’s as easy as it could be to gauge what the water level is at any given moment. If you’re able to position the appliance next to a sink then you could employ the continuous drain function using the generous 2m pipe that DeLonghi supply in the box with the DES14. The air filter has a silver ion coating, which gives it antimicrobial properties. It doesn’t filter out the bacteria as it isn’t fine enough to do that, but it does kills bacteria and other microbes upon contact, stopping them from spreading and infecting. DeLonghi has embellished this filter somewhat by calling it the ‘Bio Silver Tech System’, but being Italian we’ll let them off. The DES14 has dimensions of 19cm deep by 37.5cm wide by 48.5cm high, with its thinness being a great asset for people with limited space and also for making carrying it with the ergonomic top-mounted carry handle as simple a task as possible. DeLonghi also kindly supply a set of castor wheels which can be screwed into the bottom of the appliance should you prefer to wheel it around rather than pick it up each time. As well as being very thin it’s also very light for a refrigerant dehumidifier, weighing just 9kg out of the box. The Italians rarely let us down when it comes to design and it’s no different here. The quality off-white matte plastics with various details to break the look of the panels up ensure it looks modern and as stylish as it could be. Other than the very basic control panel, the rest of the unit is well designed, with the water collection bucket, handle and filter all easy to access. By far the best aspect of the design is the positioning of the intakes. Nearly all dehumidifiers have these on the back of the appliance, however the DES range feature these on their sides, which has the huge benefit of allowing you to push the machine up tight to a wall. A lot of people don’t realise that with most other dehumidifiers you need to leave a 20cm to 40cm gap between the back of the unit to the nearest wall. DeLonghi told us that the DES14 produces 40dB of sound, which is very low for a refrigerant dehumidifier of this power. We feel that this must however only be when the machine is ticking over in fan-only mode as when it starts dehumidifying and the compressor kicks in it is much loader. It is possibly slightly louder than some competing models when dehumidifying and I don’t think you’d want to keep this in the bedroom or the room that you watch television in, but it shouldn’t disturb you if kept in a hallway. On the control panel you’ll notice a ‘pause’ light. This should come on occasionally when the the appliance switches itself into its defrost setting. The defrost setting clears the condensing coils from ice, which would otherwise affect the machine’s efficiency. The DES14 works right down to just 2°C, however at these low temperatures the appliance will collect precious little water and will spend a lot of the time in defrost mode (like any refrigerant dehumidifier), so for good performance try to keep your home above 15°C when using this or any other refrigerant dehumidifier. 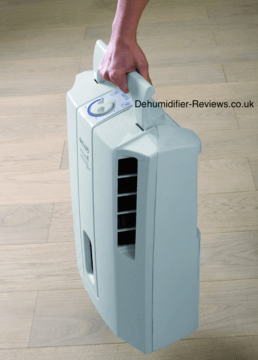 The DES14 doesn’t score higher in this category due to it only having one fan speed, but despite this it is a reasonably powerful dehumidifier and would be suitable for homes up to between three and four bedrooms in size. Just don’t expect it to collect 14 litres of water per day as the ’14L’ rate was measured at 32°C and 80%RH. Under UK home conditions you shouldn’t expect to empty the 3 litre water bucket more than once per day. The DeLonghi DES14 is a well-designed, reasonably powerful unit and so if you can cope with the manual control panel it could be a good choice. Just be careful not to overpay as we found a DES14 that was a lot cheaper than Argos and similar places at this shop.